1. Stock enthusiasm wanes: After a terrific start to the year, enthusiasm in U.S. stock markets seems to have waned a bit. 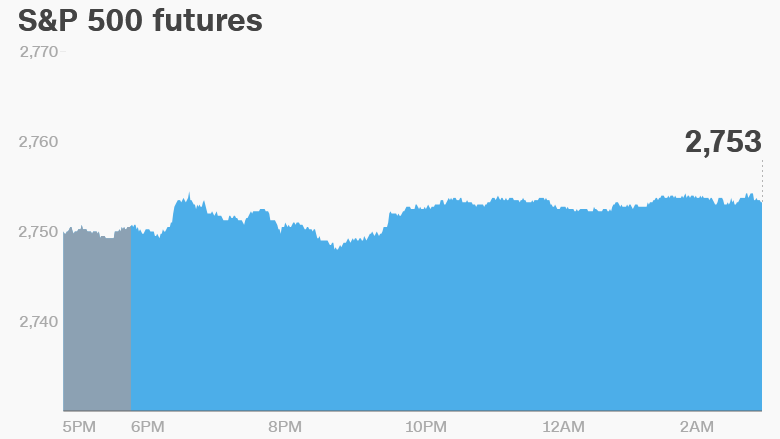 U.S. stock futures are holding steady after the Dow Jones industrial average, S&P 500 and Nasdaq all dipped by 0.1% on Wednesday. But the indexes are still very close to all-time highs set earlier this week. Sentiment has been spurred by enthusiasm over the new tax law, solid economic growth and good corporate earnings. Investors are now mulling their next moves. European markets are mostly negative in early trading. Asian markets ended the day with mixed results. 2. Market mover -- Xerox: Shares in Xerox (XRX) are expected to pop at the open following media reports that the company is considering a deal with Japan's Fujifilm (FUJIF). Xerox -- a pioneer in the photocopier industry -- is currently worth just $7.7 billion. Fujifilm is worth about $22 billion. A Xerox spokesperson said she wouldn't "comment on speculation." Fujifilm also declined to comment. 3. Bumpy bitcoin: Bitcoin trading could soon be outlawed in one of the virtual currency's biggest markets. "There are great concerns regarding virtual money," Park told reporters in Seoul. "The government has repeatedly warned about the fact that it is a very dangerous transaction but the message has not properly been delivered." Park didn't give details on when the bill would be introduced. But his comments prompted bitcoin to drop by about 14% overnight. It has since recovered slightly. 4. Earnings: Delta Air Lines (DAL) plans to release earnings before the open Thursday.